Dermoid cysts are congenital cystic tumors arising from embryonic rests and commonest site is in the thoracic region of the spinal canal. 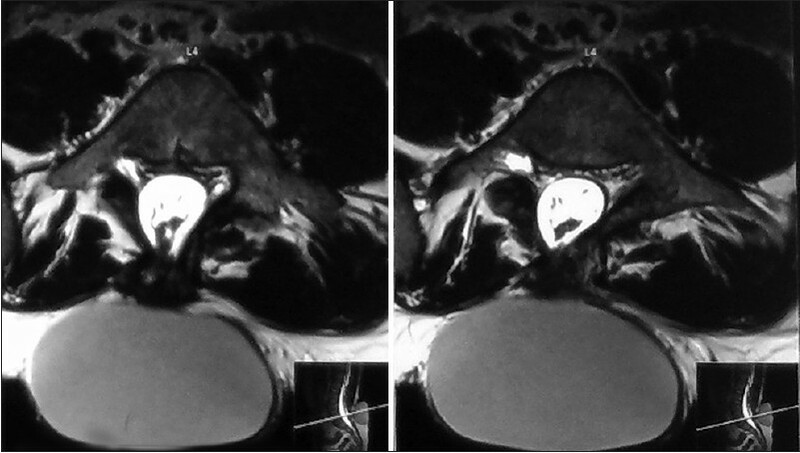 The authors reported a case of dermoid cyst in a 17-year-old boy appearing after lumbar meningomyelocele repair at 2 months of age. The boy presented with 6 months history of gradually progressive globular swelling at the site of previous scar and weakness of the left foot. Preoperatively small extradurally protruding placode was seen attached to the swelling. The swelling was completely excised. At 1 year follow-up patient had improvement in foot weakness with magnetic resonance imaging showing no residual or recurrent lesion. A 17-year-old boy who underwent lumbar meningomyelocele repair at the age of 2 months presented in the outpatient clinic with a progressive globular swelling in the lower half of the back and weakness of left foot for the past 6 months. No history of any alteration in the bladder and bowel habits. On examination a globular cystic mass of 8 cm × 8 cm size was noted at L3, L4 region sitting in the middle of previous MMC repair scar. It is poorly transilluminant and cough impulse was absent. Neurological examination was unremarkable except for weakness of the left foot dorsiflexors, having 4/5 power. 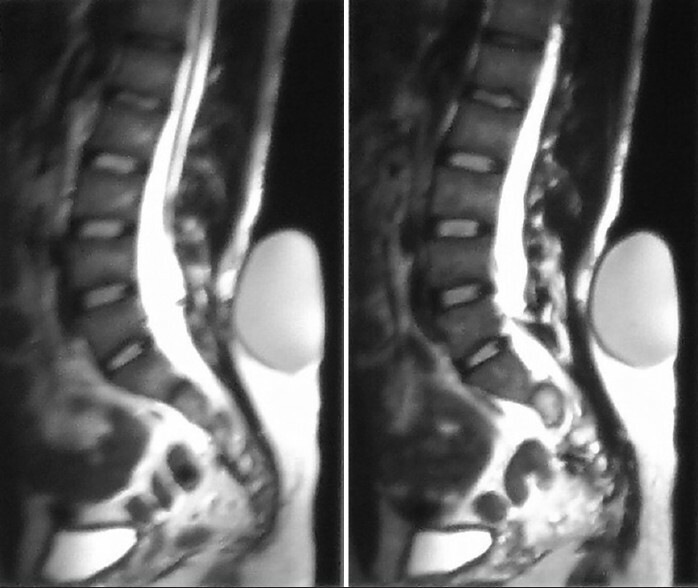 Magnetic resonance imaging (MRI) LS spine showed a fluid filled globular swelling hypointense on T1 and iso to hyperintense on T2 extending from L3 to L5 [Figure 1] and [Figure 2]. Axial T2 images show a doubtful communication with the thecal sac at L4/5 level [Figure 1]. Urodynamic flow studies didn't reveal any abnormality. A diagnosis of pseudomeningocele was made and excision of the sac with repair of the dural defect was planned. Intra operatively there was clear plane of cleavage present between the cyst and the skin and subcutaneous tissue. Small portion of the placode was seen pouting out of the thecal sac. The placode is adherent by thick connective tissue layer with the wall of the cyst [Figure 3]. There was no communication between the cyst and the thecal sac. The cyst was removed intact from the placode. Cyst opening revealed a mud colored highly viscous fluid [Figure 4]. Dura was opened and protruding portion of the placode was internalized. Patients' neurological status remained the same as that of preoperative period at the time of discharge. At 1 year follow-up patient had complete improvement in the left foot weakness. Rest of the neurological examination was unremarkable. Spinal dermoid cysts can be congenital or acquired and constitute around 0.5-1% of the spinal tumors. The congential ones arise commonly from the embryonic cell rests while the acquired ones occurring following meningomyelocele repair and lumbar puncture are presumed to be the result of inadequate excision or the implantation of the cutaneous elements in the spinal canal. ,,, However, Starrs et al. 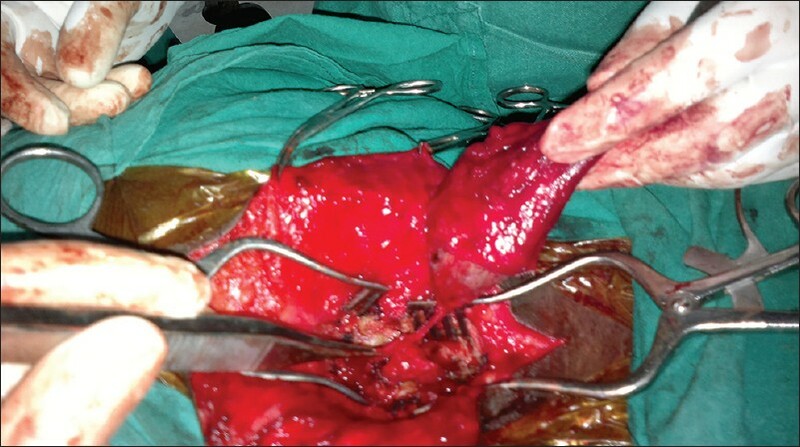 observed hamartomatous lesions in excised placodes and tethered cords giving strength to the notion that these dermoids are part of the myelodysplastic sequence and have no relation with the previous surgical repair. Scott et al. attempted to correlate the etiology and the location of the dermoid cyst by presuming the tumors anterior to the cord as congenital and those in posterior location as acquired. Implantation dermoids generally occur in the first and second decade following lumbar puncture or repair of meningomyelocele. 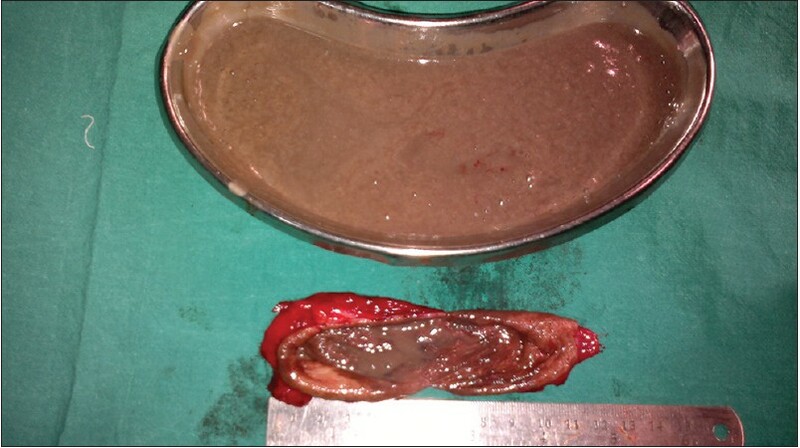 ,,, The earliest occurrence was reported following intrauterine repair of MMC at 6 months to 1 year of age. Common presenting symptoms included low-back pain or urinary dysfunction. Secondary complaints included weakness or stiffness of the legs and various disturbances of sensation. Since dermoid cyst grows slowly symptoms occur over a long period of time. MRI is the diagnostic modality of choice. Since the clinico-radiological picture resembles that of a tethered cord, most of the dermoids are identified intradurally at the time of surgery. Complete surgical excision is not possible in intradurally located tumors because of the firmly adherent sebaceous and squamous components. In contrast the case discussed here is having origin probably from the remnants of the epidermal elements on the placode with extradural location making it ideal for complete excision without any damage to the neural elements. This makes it unique among all the cases of dermoid formation after MMC repair reported in the literature. Lunardi et al. in their case series left remnants of the tumor firmly adherent to the neural elements in 9 cases. After 5-30 years one patient demonstrated tumor recurrence. Though the follow-up is short in the present case, complete excision with no neural damage assures good long-term outcome. Dermoid cyst formation can occur up to second decade following MMC repair. Complete excision with good long term prognosis can be expected in cysts located extradurally at the site of previous surgery. 1. Argenta L, Glazier S, Mark M, Proffer P. Intraspinal epidermal cyst following intrauterine surgery as cause of difficult to heal myelomeningocele repair. Plast Surg 2003;39:121-4. 2. Mazzola CA, Albright AL, Sutton LN, Tuite GF, Hamilton RL, Pollack IF. Dermoid inclusion cysts and early spinal cord tethering after fetal surgery for myelomeningocele. N Engl J Med 2002;347:256-9. 3. Lunardi P, Missori P, Gagliardi FM, Fortuna A. Long-term results of the surgical treatment of spinal dermoid and epidermoid tumors. Neurosurgery 1989;25:860-4. 4. Manno NJ, Uihlein A, Kernohan JW. Intraspinal epidermoid tumors (cholesteatoma) in patients treated for tubercular meningitis. Lancet 1956;2:437-9. 5. Roth M, Hanák L, Schröder R. Intramedullary dermoid. J Neurol Neurosurg Psychiatry 1966;29:262-4. 6. Scott RM, Wolpert SM, Bartoshesky LE, Zimbler S, Klauber GT. Dermoid tumors occurring at the site of previous myelomeningocele repair. J Neurosurg 1986;65:779-83. 7. Manno NJ, Uihlein A, Kernohan JW. Intraspinal epidermoids. J Neurosurg 1962;19:754-65. 8. Song JH, Kim MH, Shin KM. Intraspinal epidermoid cyst occurring 15 years after lipomyelomeningocele repair. Case report. J Neurosurg 1999;90:252-4.